Dozens of people were injured on Tuesday when a packed Aeromexico-operated Embraer jet crashed soon after takeoff in Mexico's state of Durango, but authorities said most were not seriously hurt and there were no fatalities. The mid-sized jet was almost full, with 97 passengers and four crew members, when it came down at around 4 p.m. local time (2100 GMT), Gerardo Ruiz Esparza, Mexico's minister for communications and transportation, wrote on Twitter. [post_ads]"A little girl who left the plane was crying because her legs were burned," said Flores, who said she was Mexican but lived in Bogota, Colombia. The plane had barely left the ground in heavy rain when it came down, she said. The aircraft made an emergency landing about six miles (10 km) from the airport, said Alejandro Cardoza, a spokesman for the state's civil protection agency. Other authorities said the crash was closer to the airport. Cardoza said in an interview that around 85 people had suffered mostly light injuries, adding that the fire resulting from the accident had been put out. The civil protection agency said 37 people were hospitalized, while the state health department said two passengers were in a critical condition. The operator of Durango airport, Grupo Aeroportuario Centro Norte, attributed the crash to bad weather conditions, citing preliminary reports. The plane had barely taken off when it felt like it was hit by a strong air current, another passenger told network Televisa. 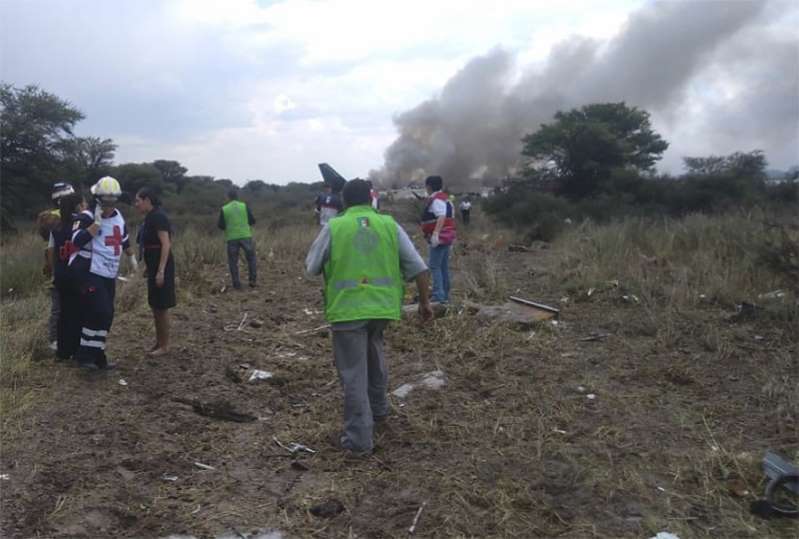 The head of Mexico's civil aviation agency, Luis Gerardo Fonseca, said it could take months to know the cause of the accident. Speaking to Televisa, he said the plane's voice and data recorders would be recovered once rescue efforts were completed. A U.S. Embassy spokesman said he did not currently have confirmation of whether any American citizens were involved in the accident. According to the Flight Safety Network, the Embraer 190 has been involved in four accidents. Only one, a Henan Airlines flight in China in 2010, involved fatalities after the plane missed its runway approach.